A new study out of the University of Pennsylvania Perelman School of Medicine shows that people who live near hydraulically fractured wells end up in the hospital more than people who don't live near wells. Researchers used databases that contained more than 198,000 hospitalizations (including multiple hospitalizations for the same person) for the years between 2007 - 2011. They looked at the top 25 medical categories cited, and the patient's proximity to active wells. What they found: people living in Bradford and Susquehanna counties ended up in the hospital more frequently than residents of Wayne county. Both Bradford and Susquehanna Counties saw a significant increase in drilling activity over the same five-year period, whereas Wayne County had no drilling activity due to a ban on drilling in the Delaware River watershed. The biggest difference was found in hospitalizations for heart conditions and neurological illness. Where there was a well density greater than 0.79 wells/square kilometer, residents experienced a 27% increase in cardiology visits compared to where there were no wells. Residents living near wells also experienced higher rates of hospitalization for cancers, dermatological problems, and a host of other health problems. Senior author, Dr. Reynold Panettieri told the press that this study is one of the most comprehensive ones, to date. But there are still questions. 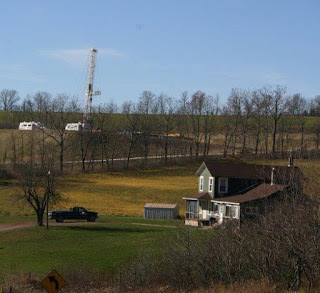 "At this point, we suspect that residents are exposed to many toxicants, noise, and social stressors due to hydraulic fracturing," he said. But he cautioned that more study is needed to determine how specific toxicants or combinations might increase the hospitalization rates. For example, cardiac issues could be related to a variety of environmental stressors, including air pollution resulting from diesel exhaust and fine particulate matter, like the sand used in fracking. While they can't say that fracking causes heart attacks, the authors do say that the increased hospitalizations over such a short time suggest that health care costs of fracking must be considered when looking at economic impacts/benefits of unconventional gas and oil drilling.